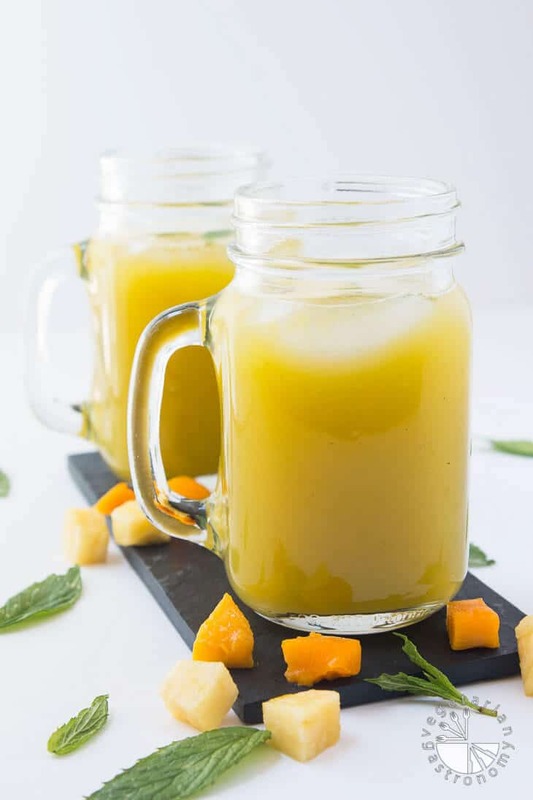 Take advantage of the summer fruits and try out this refreshing Pineapple Mango Agua Fresca recipe! It’s quick and easy, and great to have on hand for those hot summer days, BBQs, dinner parties, or picnic! I never really understood things like cucumber water growing up…that subtle flavor didn’t add much for me. It wasn’t until my last few trips to Hawaii that I started to really appreciate and love that subtle flavors that can be added to water, whether it was pieces of cucumber, mint, or some other fresh fruit or herb submerged into the water dispenser. I found that light taste to be refreshing and re-energizing in the heat, especially when served cold! 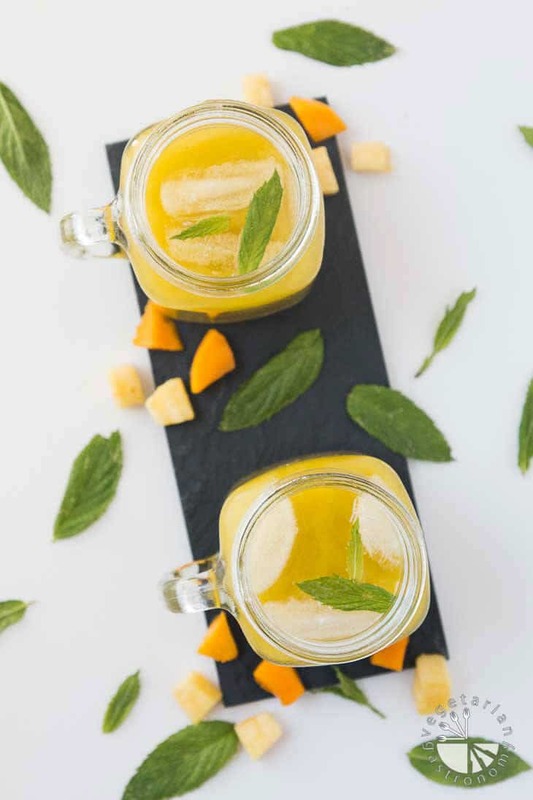 This summer I have a new favorite that takes that concept one step further…this cool Pineapple Mango Agua Fresca Recipe with Mint! I’ve never been a big juice drinker, but I love agua frescas. They’re basically light fruit non-alcoholic drinks made by blending fruit and herbs with water! Make sure the fruit is juicy and ripe (otherwise it may not add much flavor). Add some fresh lemon juice and fresh herbs. Filter for smoother water-like texture. Use a high powered blender to make unfiltered agua fresca (the fruit blends in and leaves minimal pulp and fiber). Although I enjoy the unfiltered version on occasion, especially when I’m too lazy to filter it through a sieve, I honestly prefer the taste and texture of the filtered agua fresca so that it tastes and feels more like flavored water. We’ve been taking advantage of the fruits in season, so we’ve been buying fresh pineapples and mangoes by the box every week from the grocery store, cutting them up, and enjoying the fresh fruit throughout the week. In my house, freshly cut mango and pineapple doesn’t last very long, so it’s hard to allow myself to use up some of it for other recipes. But thankfully, Agua frescas are just another refreshing way to enjoy fresh fruit! Not to mention they are both really sweet and juicy, so you really don’t need any added sweetener! After experimenting with a few different agua fresca recipes, I’d have to say that this combination is my favorite. 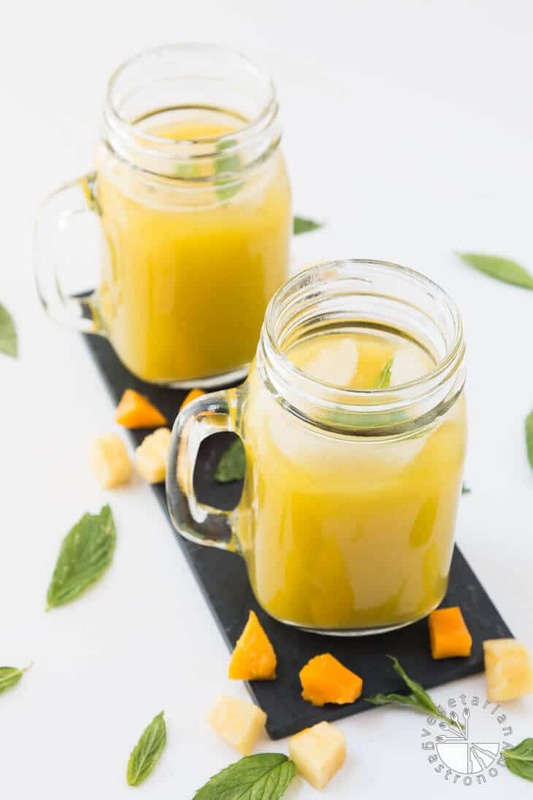 Fresh cut pineapple and mango, lemon juice, and fresh mint and a blender is all you need to make a refreshing jug of this Pineapple Mango Agua Fresca. I typically like to strain it through a sieve, but as I mentioned above, you can just as easily enjoy it unfiltered. You can add a sweetener to taste. 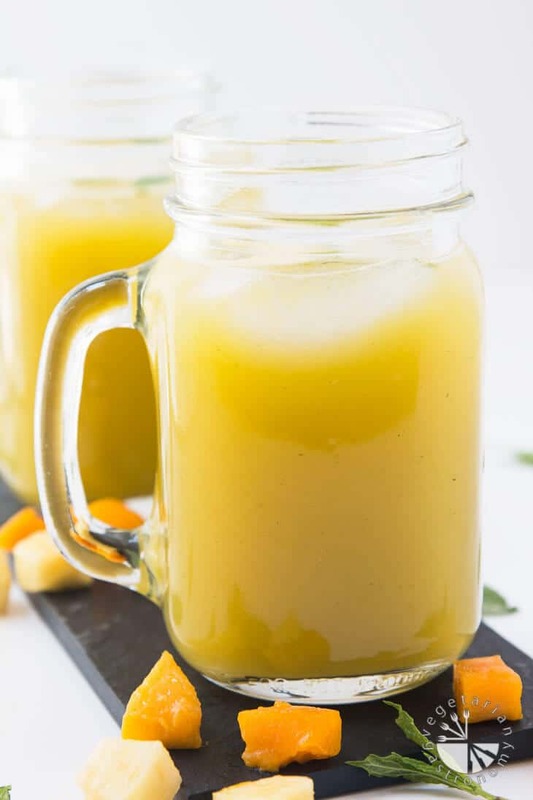 Take advantage of the summer fruits and try out this easy, quick, and refreshing Pineapple Mango Agua Fresca recipe! It’s perfect to have on hand in the fridge and sip on throughout the week! 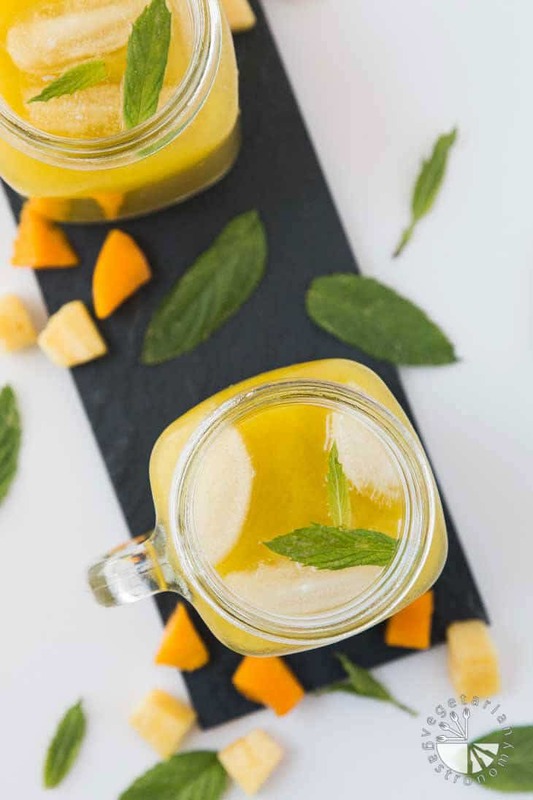 Take advantage of the summer fruits and try out this refreshing Pineapple Mango Agua Fresca recipe! It's quick and easy, and great to have on hand for those hot summer days, any BBQ, dinner party, or picnic! 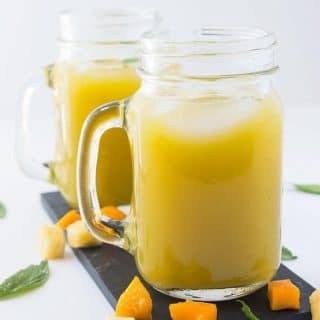 Add the mango, pineapple, mint leaves, lemon juice, 1 cup water, vanilla extract (if using), and raw sugar/maple syrup (if using) into a blender. Blend on high until completely pureed and no pieces remain. Taste and adjust with additional lemon juice, fruit, and/or sugar if needed (remember that you will be diluting this for the final drink). Filter the pureed mixture through a mesh or fine sieve to remove any remaining fiber or pulp (alternatively you can skip this step if you prefer unfiltered agua fresca). Add the filtered fruit pure into a tall pitcher. Add 3 cups cold water and mix. Feel free to add more or less water depending on preference for how concentrated you prefer the agua fresca. Serve over ice or store in the fridge and enjoy for 2-3 days. Agua fresca is very forgiving, so feel free to adjust ingredients. You can use other fruit combinations, different herbs, and make it filtered or unfiltered. Wow, this is such a perfect refreshing summer recipe! You always seem to surprise me with your recipes! I love this easy recipe and will definitely give it a try. Its also very healthy opposed to the refined sugary drinks and that is what summer should be about, easy, light yet healthy :) Those jars are the cutest!PS: I do not see the rating stars.. Thank you Reshana! Yes you need to try this one, you can even use any sweet fruit in season, although this combo is definitely a favorite. The jars make it even more fun :) I'll email you about the rating...not sure what's going on. I looooove agua frescas! This version sounds so refreshing and so good! They're so refreshing and I love sipping on them throughout the week! This combo is by far my favorite! Such a lovely and refreshing drink! I love mango and pineapple, amazing flavours! That sounds really really tasty, peach makes for a lovely flavour in a drink. This sounds so great, it'll go perfectly with my barbecue this weekend! Awesome! I know you'll love it! This sounds so refreshing! Perfect for a hot summer afternoon! I've been craving sweet, fruity drinks like these in the afternoon! Can't wait to try this one, looks like perfection! Thanks! This is the perfect afternoon light refreshing fruit drink! I was immediately hooked by the fruity sound of this fabulous drink, the word "refreshing" could not be any more apropos! I have to admit I've never really appreciated the subtly of herbs and cucumber in my infused water or smoothies either, but alongside pineapple and mango I am more than willing to take your word for it and find out. Altogether this just sounds so yummy and like summertime pool-side sipping perfection! Thanks Natalie!! With the summer fruits in season, I couldn't resist creating this! I love having it, especially since we've been getting a heat wave here over the summer! This is so perfect for the summer heat here in LA! What a great refreshing combo. Perfect for the summer season. This is definitely my kind of drink! I love agua fresca and am adding this recipe to my collection! Thanks Amy! I was never much into agua fresca before, but now LOVE it! Especially this summer fruit combo! My mum will be glad to see me use up some of the lemons from this season! We have a Eureka tree that groans under the weight of the lemons each year and we get so many we can't keep up with them! Oh wow that's awesome! I typically squeeze all my lemons in my citrus juicer and then place them in ice cube trays to freeze. once they're done, I take them out and store them in freezer in ziplock bags! Super convenient! Not only is it beautiful, but this beverage sounds so refreshing for these hot summer days! Love the combo of pineapple AND mango. Me too! Can't beat the summer fruit...this is so light and the perfect afternoon refreshment!